Home › Everything else › My selection for the Democrat presidential nominee in 2016 is . 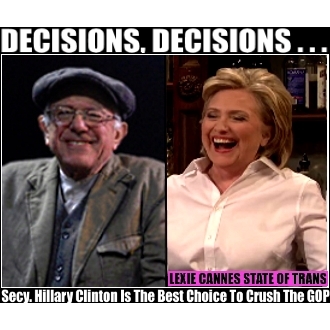 . .
LEXIE CANNES STATE OF TRANS — My selection: Secretary Hillary Clinton. This is a strategic decision that would most likely result in maximum damage to the GOP on election day in November — curtailing their ability to create obstruction, logjam and chaos in Congress — something they said they would do, and have done, since they took Congressional power in 2010. And they’re doing it right now with the death of Justice Scalia. Clinton’s election likely would be the stake in the heart of the GOP — returning it to the hands of moderates, with the tea party finished — the chaotic and divisive voices silenced. Senator Bernie Sanders, in a perfect world, would be my choice for the top spot on the ballot. Ideologically, I align with him on issues more than Secy. Clinton. But we don’t live in a perfect world. Sander’s utopia is at least a generation away — it’s coming, but history shows it won’t occur in 2016. Mitch McConnell will still be in the Senate and continue to do what he’s done for the last 6 years — obstruction, logjams and chaos. And the House? Likely to keep trying to appeal Obamacare and little else. Millennials need to start getting themselves elected to Congress for Sanders’ ideals to become reality. I really look forward to this. A ticket with Secy. Clinton at the top will switch more seats to Democrats than Sanders could ever possibly hope for. The Democrats may gain control of the Senate, and with luck, the House, resulting in a total destruction of the Republican party. If there’s ever a person qualified to deal with GOP mudslinging, obstruction and chaos that’s likely to follow in the immediate aftermath, it’s Clinton. She’s been handling this for 30 years. And finally, the number one reason we elect presidents — they fill vacant seats in the Supreme Court. The likely increase in the number of Democratic seats in Congress from a Clinton leading ticket gives her more leeway with a selection(s) — a much stronger hand than Obama has now. A number of allies on the bench are in fair health and/or wish to retire. A crushing blow to the GOP on election day will allow the Democrats to set the Supreme Court scale towards the left for decades. Hillary Clinton is the one holding a huge sledge hammer to ensure this is done. Disagree? There’s no need to quibble. If you like Sanders, by all means, vote for him. If you’re looking to give the GOP a crushing blow, vote for Hillary. If you must vote for a Republican, vote for Trump. Your decision. ‹ Justice Antonin Scalia is dead; Our long national nightmare is over! I am preferring because I tired of selecting the lesser of evils and old politics. I predict that Hillary will go back toward right when and if she gets nominated. The system is broken in both parties and the first to smarten will be the future. Hilary’s husband’s changes in the party have outlived their usefulness. I’m more interested in the destruction of the GOP than anything else. Thanks for the comment. She’ll win. Moderates will flock to her to avoid a Trump or Cruz. Bernie? Moderates may stay home. That’s the danger. Following the links, Eric Zuesse makes good arguments for the Democrats and why Bernie would be more likely to inspire a big Democratic vote which would spill over to Congressional races. We can’t run a double-blind study to see if Lexie or Eric is right. we all remember that reset button with Russia. How’s that working out. Taking down Libya government. American murdered now good part of Libya controlled by Isys. Well done Secretary Hillary Clinton. Abandoning Iraq after all the experts said it would fall apart if we left to soon. Receiving hundreds of millions Dollars to Clinton foundation. You can say that the woman done well. For Hillary where for the country?? Not sure what this has to do with my strategy. Hillary will clobber the GOP, Bernie will merely beat them. I don’t care about anything else. Bernie has yet to demonstrate that he can build a mulitcultural coalition. Yes he won in overwhelmingly white New Hampshire. But Black voters, which are critical to the success of the Democrats, ain’t ‘feeling the Bern’ and he’s getting clobbered in South Carolina. And what ‘new voters’ are your talking about? I do recognize your logic, But either candidate will deal a serious blow to the GOP. I think you might underestimate Bernie. My biggest worry is HRC’s corporate alignment and even in a mere four more years, the middle class just may be too starved to save. IMHO. My underestimating Bernie would be a good thing if he got the nomination. Right now, all I want to do is hammer the GOP and Hillary is the one to do it. I tend to agree with your pragmatic view of the situation. My Bernie friends have been chipping away at my confidence that this is the most effective action for a minority group such as we are. Bernie may be more liberal, but the big view includes how effective he may be in the office of president. I grin at the thought of the calamity that might occur as a Republican response to Clinton gaining the office. M.
In the polling, Clinton only beats Trump in a general election. Sanders beats all Republicans in the polls. My original choice for president was Bernie Sanders. When there was a local Sanders event, I signed up, and communicated with the organizer the night before. When the event was to take place, the organizer, and I agreed to meet at a certain spot. I arrived a few minutes early, and described what I was wearing. As soon as she saw me, the event canceled. I am not-white, and my name is Arab–probably too different from the average Bernie supporter. What she didn’t know is that I am also a college student. In most of the photos I see with Bernie Sanders, his constituents seem to be white Americans. Vermont is far from the most integrated state in this country, but that is no excuse for a lack of diversity in a U.S. Presidential campaign. There are Hispanics, African Americans, Asians, and many other “ethnic” people in the U.S. that vote. After this disappointment, I shifted my focus to HRC. Clinton may walk the walk, but Sanders has always talked the talk. This is reminiscent when Clinton was the “chosen” nominee but Obama came from nowhere with an unprecedented grass-roots campaign to beat her and win two presidential elections. What we need is a person who reflects the general wishes of the 98% Occupy. To put a status quo person to snuggle with corporate skullduggery, will further damage America. But make no mistake about it, the President needs to be a BULLDOG and the Republigoon Congress needs a Democratic lawn mower to clean house. Polls currently indicate Bernie would beat any republican nominee, by a wider margin than Hillary. And she only began to support lgbt rights when it became advantageous to her political career. She is extremely corrupt and will betray her supporters. Alexander, can you cite the corruption charge Hillary was convicted of? You used the word “extremely” so I suspect there are several convictions.